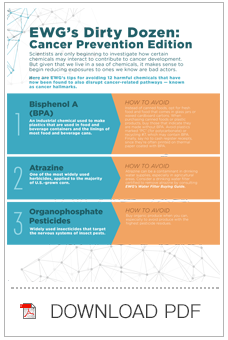 Here are EWG's tips for avoiding 12 harmful chemicals that have now been found to also disrupt cancer-related pathways — known as cancer hallmarks. Bisphenol A (BPA) An industrial chemical used to make plastics that are used in food and beverage containers and the linings of most food and beverage cans. How to Avoid Instead of canned foods, opt for fresh food and food that comes in glass jars or waxed cardboard cartons. When purchasing canned foods or plastic products, buy those that indicate they are made without BPA. Avoid plastics marked “PC” (for polycarbonate) or recycling #7, which may contain BPA. Finally, say no to cash register receipts, since they’re often printed on thermal paper coated with BPA. Atrazine One of the most widely used herbicides, applied to the majority of U.S.-grown corn. How to Avoid Atrazine can be a contaminant in drinking water supplies, especially in agricultural areas. Consider a drinking water filter certified to remove atrazine by consulting EWG’s Water Filter Buying Guide. Organophosphate Pesticides Widely used insecticides that target the nervous systems of insect pests. How to Avoid Buy organic produce when you can, especially to avoid produce with the highest pesticide residues. Dibutyl Phthalate (DBP) Widely used in nail polish until 2006. That use was voluntarily halted, but it is still an ingredient in soft and flexible plastics such as shower curtains, raincoats, food wraps and bowls. How to Avoid Limit use of soft plastics for purposes such as storing food and limit the use of PVC plastics. How to Avoid Use EWG’s Water Filter Buying Guide to limit your exposure from drinking water, and be careful when removing crumbling old paint – a major source of exposure. Mercury Along with its organic form, methylmercury, it is toxic to the brain, kidneys, liver, heart and nervous system. Mercury exposure during pregnancy is highly dangerous to the developing fetus, leading to impaired development of the brain and nervous system. How to Avoid Some seafoods – especially canned albacore tuna, swordfish and some types of sushi – are especially high in mercury. Use EWG’s Seafood Calculator to determine which fish is safest for you to consume. PFCs Per- or polyfluorochemicals, widely used to make, among other things, water-, grease- and stain-repellent coatings. How to Avoid Find products that haven’t been pre-treated with stain repellents and skip home-applied treatments of carpets and furniture; limit fast food and greasy carryout foods that often come in PFC-treated wrappers; choose clothing that doesn’t carry Gore-Tex or Teflon tags as well as fabrics labeled stain- or water-repellent; avoid non-stick pans and kitchen utensils; don’t use microwaveable popcorn bags; and finally, select personal care products without “PTFE” or “fluoro” ingredients. Phthalates Common industrial chemicals used in PVC plastics to make vinyl toys soft, as well as in solvents and synthetic fragrances. How to Avoid See #9. Diethlyhexyl Phthalate (DEHP) The most commonly used of a class of phthalates that may be associated with alterations in thyroid hormone levels. How to Avoid Phthalates may be used as a fragrance ingredient in products. Since it isn’t listed separately on labels, choose personal care, cleaning products and air fresheners without “fragrance” on the ingredient list. Plastics also often contain phthalates, so avoid cooking or microwaving in plastic and give your children wooden or phthalate-free toys. Many products – from lawn furniture to some clothing (such as raincoats) to shower curtains – contain DEHP vinyl. Try to avoid them. PBDEs Chemical fire retardants widely used in polyurethane foam products manufactured before 2005, including upholstered furniture, mattresses, pillows, couches, carpet padding and electronics. Although they have been taken off the market, they are incredibly persistent and continue to be a reason for concern. How to Avoid Avoid foam products manufactured before 2005 and look for those made after 2014. Read labels, visit manufactures’ websites and ask what chemicals are used on their products. Use a vacuum fitted with a HEPA filter to remove particles from your home. Triclosan An ingredient in many liquid hand and dishwashing soaps as well as many personal care products. How to Avoid Forgo antibacterial soap and other antibacterial products, such as toothbrushes, toys and cutting boards. Nonylphenol Widely used ingredient in industrial and consumer products such as detergents, paints, personal care products and plastics. How to Avoid Start by checking out EWG’s Guide to Healthy Cleaning and avoid products that list nonylphenol as an ingredient.